A graceful combination of items makes our Extraveganza extraordinary. It is both Vegan and Gluten Free, we place importance on carrying vegan food that is delicious for all diets. The beautiful Grace and I Fruit and Nut press is hand layered to make it an exceptional gift. The Belvoir Edlerflower Presse is a Fancifull Favorite, light and sparkling with a touch of lemon, so refreshing. 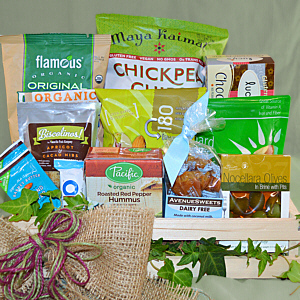 We fill the rest of our all vegan basket with Sea Salt Vegan Caramels, Chickpea Chips, Green Olives, Napa Valley Rosemary Almonds and Pistachios and a Lavender Garden (all necessary ingredients are in the bag, you just add water). This basket is a palate and visual delight.